Ashley Hathaway is a native of Raleigh, North Carolina where she began her ballet training at age 6 at the Raleigh School of Ballet. Having grown up in the capital city, she was chosen to be part of Carolina Ballet’s productions from a young age and was the very first Clara in The Nutcracker. Ms. Hathaway continued her education at the University of North Carolina School of the Arts and has also trained at the School of American Ballet, Pacific Northwest Ballet, and Jacob’s Pillow. 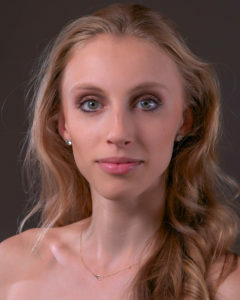 Upon joining Carolina Ballet, Ms. Hathaway’s featured roles include Lucy in Lynne Taylor-Corbett’s Dracula, The Sugar Plum Fairy in The Nutcracker, and Juliet in Robert Weiss’ Romeo & Juliet. In the summer of 2018, Ms. Hathaway was picked to dance at the National Choreographers Initiative in Irvine, California.